An 18-year-old driver who died in a two-car crash on the A82 in the Highlands has been named by police. Samuel Foster, from Lochend, near Inverness, died following the collision at Dochgarroch at about 22:20 on Sunday. 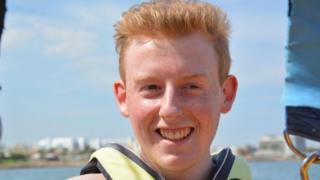 In a statement his family described him as a "happy-go-lucky boy" with a "huge circle of friends". Samuel's Renault Clio collided with a Ford Galaxy. The female driver of the Galaxy suffered minor injuries. Samuel was a former pupil of Millburn Academy in Inverness and studied engineering at Inverness College UHI and worked in the city. His family said: "He also worked at the bakery at Marks and Spencer for two years and loved his motocross biking and cars. "Samuel was a happy-go-lucky boy who was always happy and friendly. This picture is how we will remember him, always with a smile on his face." They added: "Samuel was the youngest of four siblings and words can't express how much he will be missed by his parents Heather and Lenny, his brother David and twin sisters Samantha and Kirsty, his nephew Reuben and niece Georgie. "We would like to thank the incredible number of people who have sent us messages of sympathy - your kind words mean so much and are a reminder of just how popular and well-loved Samuel was. "We hope he will always be remembered this way."